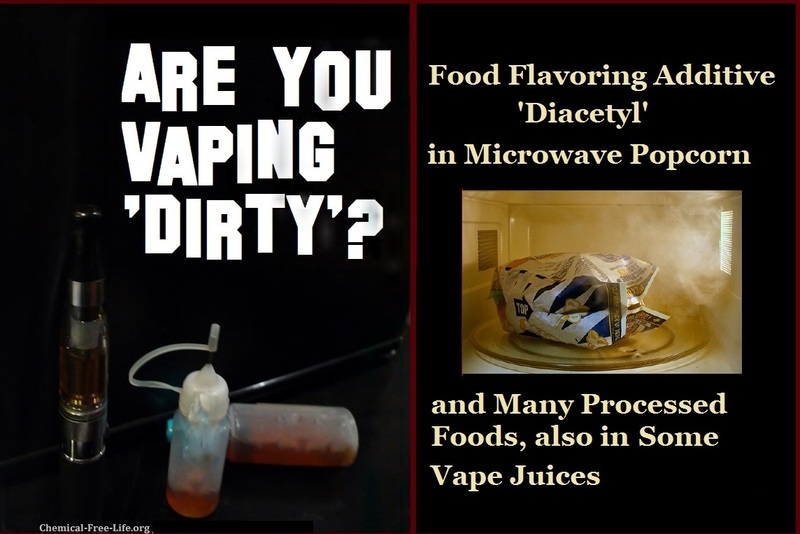 Now to be clear, there is no definitive scientific evidence linking vaping of ‘diacetyl’ to health problems. [“Right now, according to the non-profit Cancer Research UK, there’s still “no good evidence” that vaping causes popcorn lung and there have been no reported cases of popcorn lung in e-cigarette users. A 2017 paper in the journal Toxicology also said that, so far, there are no reported cases of the condition from flavored e-cigarettes.” (source)] And there are no scientific studies testing the effects of vaping organic-only products. For those who want to reduce the risk of putting the chemical ‘diacetyl’ into their bodies whether it is via vaping, breathing in the fumes from microwave popcorn–or via the many highly processed foods in which it is currently present–the key is to go organic whenever possible. And when going organic is not possible, avoid highly processed foods (and commercially-produced flavored vape juice), always read the ingredients labels (where they exist) and just say “no” to this food additive. Diacetyl is a food flavoring additive responsible for “buttery” flavoring such as found in microwave popcorn. Scientific studies have linked Diacetyl to serious health outcomes including neurotoxicity and Alzheimer’s Disease. Diacetyl derivatives may contain sulfites (as adducts) which may be unlabeled and can be problematic for those individuals with sulfite sensitivities such as people with asthma.